The unexpected donation of an old FedEx truck may not be an answer to prayer for most churches. 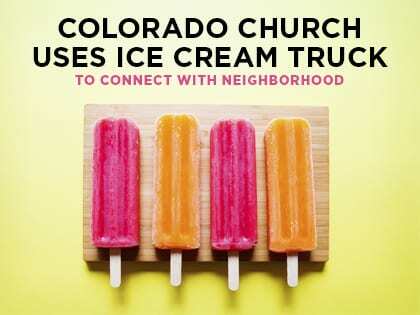 But for Rock Family Church in Colorado Springs, Colorado, it’s exactly what Pastor Dean Hawk needed to fulfill a vision: an ice cream truck that would give out free treats to the community. After an initial investment in maintenance work for the truck, decals and, of course, ice cream, the bright green truck began making its way around the community about one year ago. During those first few Saturdays, Hawk and others noticed there were fewer kids playing in their neighborhoods than the church had anticipated. But when they began taking the truck to parks and regular outdoor events, the lines grew deep. Rock Family Church, which sees about 1,400 worshipers each week, regularly reaches kids through book bag and meal giveaways, as well as movie nights. Those waiting in line for ice cream receive an invitation card to the church’s kids’ ministry program. Reaching kids is one of the most important charges of the church, according to Hawk, and for only $150 a week, the truck is a helpful and affordable tool. So what happens during the winter months, when ice cream doesn’t sound so good? Hawk’s solution: The ice cream truck is transformed into a hot chocolate truck.